Download our free Running Injuries Treatment Guide to learn more. 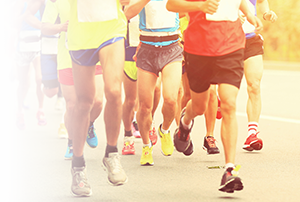 Sixty percent of runners will experience a running injury at least once during the year. Runners usually suffer some sort of injury in the knee, but conditions like Achilles tendinitis, plantar fasciitis, shin splints, iliotibial band syndrome (ITBS) are some of the most commonly diagnosed injuries. Cleveland Clinic Sports Health specialists use the latest diagnostic technology to evaluate your injury and develop a specialized care plan to help you recover from a sports injury as quickly as possible. To schedule an appointment with Cleveland Clinic Sports Health, please call 844.365.6752. As our patient, you have access to the same specialists who treat Cleveland’s professional sports teams and the orthopaedic program ranked #3 in the nation by U.S. News & World Report.